Very sorry to hear this, often bumped into Mike at various CCL venues and always enjoyed our chats. Thoughts with Kathy and the family. Hartley trophy presentation: https://www.youtube.com/watch?v=-SH5gKDGXl8 Match highlights to follow. 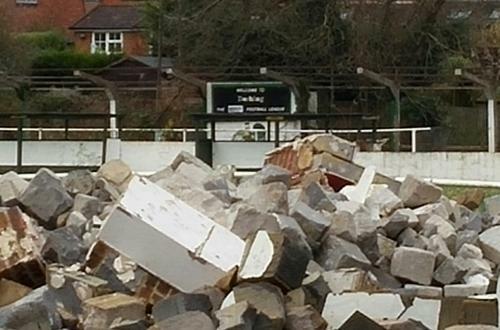 division 1 will lose Dorking FC (disbanding) Dorking Wanderers Reserves have applied to join. Ho ho. Many congratulations to Hartley for retaining their title! Went along to Westfield 1-1 Spelly last night. Westfield will view this as 2 points dropped i think as they made most of the running, went ahead early on through a Carder-Andrews header. Spelly equalised a few minutes from the end, a nicely delivered free kick leading to confusion in the box and Dyett eventually slotting past the keeper. Not sure I can recall much in the way of Spelly goal attempts before that, Westfield had a fair few chances but were often wasteful, though the young keeper made a couple of decent saves. Good effort from Knappers tonight, in front of a bumper crowd at Kingfield. Shelley made a few good saves and they got themselves into a number of promising positions in the second half, only to fall short in the box either dithering or snatching at chances. Good night for them though. Via the club solicitor he said. Utterly pathetic of them. Did you run this thread past the club solicitor before you resurrected it TSF? Just to be on the safe side. Good luck to you if you want to remain involved in 'Dorking Football' going forward, personally i'd tell 'em where to stick it. Of course I forgot the man in the middle. Did he come in from Kent? Apologies for assuming it was those coming from Frimley! Exactly BJR, no surprise. The only surprise is that clubs travelling relatively short distances to games always without fail seem to use it and then wonder why they are stuck in traffic! Montage of the 2015/16 season featuring Combined Counties clubs in the League and FA Vase/FA Cup competitions. Thanks Jeff, appreciate the sentiment but always prefer to pay my way (or get Smudge to pay if he's with me ). As for Mr Bransbury, If only i'd had the camera with me last Tuesday he'd have a couple in there for sure. Hope he has another stormer Wednesday! ...it is now! My lookback at the season, as captured on the trustee handheld! Look out for a special guest appearance from a popular forumite Thanks for all the views over the season! The more I read about this alliance, the more it seems to me that Dorking FC is effectively looking to become Dorking Wanderers youth/reserve side and a feeder predominantly for their first team. If that is the case, I think that's a shame. Dorking 4-1 Chess & Hook Really good cup tie this for the first game back in Dorking. Chicks raced into a 3-0 half time lead, including a great Bransbury goal as he darted down the left wing and lashed it in past the keeper. Tables were turned in the second half and it was all Chessy, quickly getting one back and then having another disallowed. They kept up the incessant pressure and passed up several chances, Chicks unable to get out of their own half. Chicks stand-in keeper made several terrific saves to keep Chessy at bay but Chicks started to get back into the game, Smith hitting a wonderful volley which went just wide. Bransbury took the pressure off with another great finish over the keeper to get his hat trick & make it 4-1. Chessy never gave up and had more chances, but Newland was equal to them. Great entertainment and a cup final to look forward to.